Fire features are not only installed for decorative purposes but also for their important functions in the outdoors. They provide the much needed warmth during cold days and nights. These features are also great additions to your outdoor living spaces. You will surely agree that a fire pit installed in your patio or pool deck area will make your outdoor living experience more relaxing and comfy. Installing one in the garden area is also a common setup since this fire element attracts people. With these benefits, you should install at least one fire pit in your backyard. 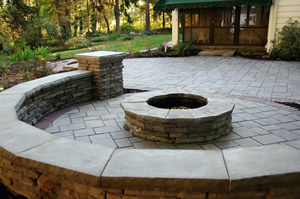 And here at Piracci's Landscaping, Inc., you can hire our services to install pre-built or custom designed fire pits. A lot of contractors in Pennsburg and surrounding areas provide similar services such as ours. However, most residential and commercial property owners in the areas we serve still choose us because of our experience and ability to create highly customized fire pits. We have already installed numerous fire features for residents of Bethlehem, Center Valley, Coopersburg, and Quakertown, PA. Dial (215) 541-9202 to learn more about our rates and other hardscaping services. At Piracci's Landscaping, Inc., we always follow systematic procedures when installing concrete fire pits. This fire pit type must be carefully designed and built using only the finest materials available. The aggregates, mortar, concrete mix, rebar, and other supplies that we use are top-quality to ensure the durability of the concrete structure. We also use fire bricks and lava rocks in our design to protect the concrete from cracking. If you think that our concrete fire pits are dull and boring, you're wrong. We apply decorative techniques and other finishing methods to give you eye-catching fire features. The fire pit exterior will be covered with clay bricks or natural stones to achieve your desired look. We will also add accessories to make your outdoor stay safer and more fun. The best add-on to your flagstone patio or deck is a stone fire pit. It is also best installed in the middle of your garden or any area in your landscape. But don't just use any type of stone on your new outdoor amenity. You will be able to create a more interesting outdoor setting if you will use carefully selected natural stones on your fire features. And here at Piracci's Landscaping, Inc., you won't encounter any difficulty in building this amenity since we have the expertise and experience. We can help you build an exquisitely designed stone fire pits in your backyard at client-friendly rates. We have reliable suppliers of premium stones and the right installation tools and equipment, so it’s easy for us to create custom-designed stone features. Easy installation is one of the great things about block fire pits. Some manufacturers offer fire pit kits that can be assembled in DIY manner. However, most DIY project results in subpar workmanship, so avoid this pitfall by just hiring our services. Our skilled crews know the proper installation procedures and are well-trained in the use of masonry tools. The materials for your block fire pit can be clay bricks or concrete blocks, depending on your desired design.